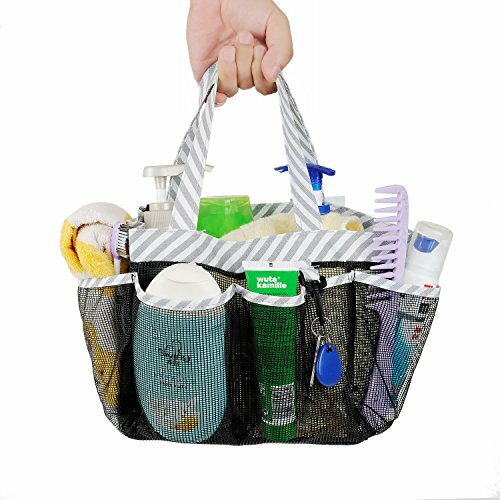 When you are a college student or a parent like me shopping for a kid going off to college I’m guessing you landed here looking for the best shower caddy for college? Well, read on, we’ve narrowed down the options on the market to come up with top three picks that are durable, have enough convenient pockets and space to hold all your toiletries and bottles to make it back and forth to the shower without stuff falling everywhere. Keeping things tidy in the shower area can be pretty tricky – particularly for someone who lives rushing from here to there, like a college student. Whether you live in a dorm with a hall bathroom or in a suite with its own bathroom, you still need something to organize all your toiletries and bottles of gel, shampoo, and conditioner and keep your personal stuff separate from roommates. Shopping for my son who was going off to college (class of 2021) I spent a ridiculous amount of time researching online and making trips to the local Target. Honestly, I’m kind of OCD when it comes to product research so in hindsight I spend way too much time on this, considering it’s such a simple product (that he doesn’t even seem to care about) but I thought I’d pass on my findings in case it helps you. In the end, I finally decided on this caddy/organizer from The Fine Living Company – mostly because I wanted something for him that zips shut, but you might find a better use for one of the two other options depending on what you’re looking for. If you are gearing up for college, make sure to also check out our top picks for best shower shoes, having good shower shoes and a caddy and you’ve covered your bases for a dorm shower and should be pretty much set. Few things can be more annoying for a college student than finding time to shop for worn-out accessories. The quality of a shower caddy should be good enough to last for at least 3 or 4 years, as these items shouldn’t be subjected to a lot of wear and tear. In any case, it’s important to purchase a caddy with good durability. One caddy should be more than enough to carry every bathroom accessories needed by an average college student. Storage space also goes hand in hand with the ability to properly arrange every item inside the caddy! Is the caddy water resistant? Does it have a handy strip from where it can be hanged from a hook or showerhead? Additional features can make a product way better than it is, and they can even increase its lifespan when you make the best out of it. Some features could be crucial to the products overall quality, especially if taken full advantage in a bathroom shared by many people. This smartly-designed product offers buyers a great way to organize their bathroom items. The quality of the fabric is good enough for most owners and it generally keeps everything in place when hanged, as the design allows the product to keep a good shape. The product also comes with a toiletry organizer to further aid in the owner’s bathroom sorting, but the one main recurrent issue that seems to present often is related to the zipper quality. Some products’ zippers tend to break too soon. Although some customers have complained about the size of the caddy, most assure that it offers enough room to store every handy bathroom item, so there shouldn’t be much to worry about when it comes to sizing. If you’re a fitness maniac and love visiting the gym often, this bag could also work wonders for you! It’s easy to carry around and to place it wherever you need. Has enough room to hold every basic bathroom item, and it offers good storage to sort them out. Top-quality fabric allows the caddy to stay functional for a long time. Additional toiletry organizer is a huge plus for those looking to keep everything tidy. Read reviews of this shower caddy here. This portable shower caddy offers a good-looking design and rip-resistant stitching, and from the feedback, it seems to lives up to the hype. The polyester that it’s made of resists water decay as much as any other good product would and Blue Ocean Bos claims that it’s great for college dorms. It could prove to be a bit tricky having it keep its shape after placing all of your bathroom items on it, so keep that in mind if you plan on using it to store all your things. Although it struggles when filled, the bag is pretty big and should hold most of your stuff at once. The one main issue appears to be the bottom of the bag, which isn’t solid enough and seems to be the main cause of its lack of rigidness when fully loaded. Regardless, the design allows the water to pass through the fabric if wet, making it easy to clean. It also makes the product very resistant to collecting water and helps it dry quicker. Update: Last time we checked on this product (May 28th, 2018) it was being delivered with a free splash proof PVC zipper pouch included in the package) which is a useful bonus item if you need to keep things dry while you are in the shower). Rip-resistant material gives the product a longer potential lifespan. Side pockets allow you to sort items externally, not only inside the caddy. Can fit towels comfortably, making it ideal for college dorms or gym visits. Falls off when facing a heavy load. If you own plenty of bathroom accessories and wish to use this caddy, it might not be the best option for you. Ironically, if it isn’t full, it might not hold its shape properly. The handle isn’t as long as it should be. Hanging the caddy could be a nuisance at times. There isn’t really much to say about this product other than what you see in the photo – it’s a cheap alternative to the more expensive caddies and it has left customers very satisfied so far. It doesn’t lose its shape when hanged and it’s spacious enough to hold more than enough bathroom items inside for most students. If you are looking for a simple solution for a budget caddy or replacing a broken one, this mesh one is a decent pick for the price range. There’s nothing really keeping you from only using this to go away for college. Many consumers buy it for gym use, but it’s simple design also makes a good match for dorm life. Pockets on the outside give owners a chance to properly sort their items; even if there’s still room inside, it won’t lose its shape. 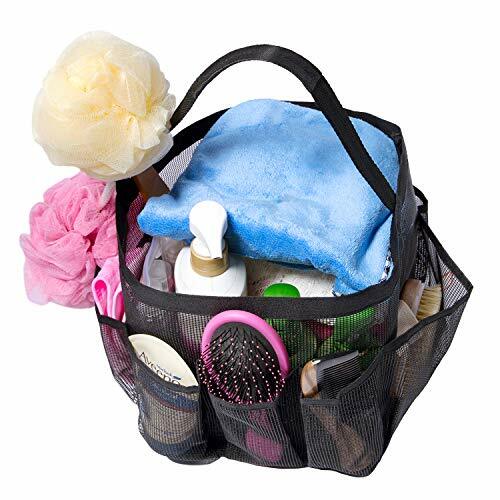 The negative would be that there is no closed or zippered pocket if you are looking to organize or keep smaller items safe, but again for this price you really can’t be looking for much more than a simple carry case with an easy way to separate bottles, loofa and other small items. A very affordable product at basically half the price of the competition. The quality design gives plenty of room to store items but doesn’t limit usage to owners with plenty of products. The fabric tends to last for a long time given the mesh’s quality. It could prove to be uncomfortable to take items out when it’s in a hanging position. The Haundry Mesh Shower Caddy has a key hook attached to it, which is a great place to keep your keys. The design of this caddy is very unique and is perfect for college students who live in dormitories. It is 8.86 inches long, 7.68 inches wide, and 8.07 inches tall. 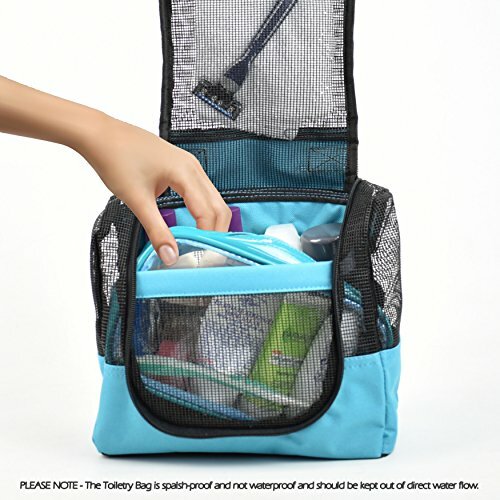 There is a big main compartment and seven smaller outer compartments so you can organize your toiletries and room accessories. You don’t ever have to lose precious time looking for your stuff again. It is made of a high-quality durable mesh. It is a completely breathable fabric that dries quickly. The handles are reinforced Oxford cloth so that it doesn’t tear when carrying heavier items. Two handles are definitely better than one. With this caddy, you won’t find yourself losing your stuff when taking a trip to a communal shower. It’s easy to carry and keeps your items clean and organized. You can hang it over your door, showerhead, or stand. You can also use this for outdoor trips like camping, swimming, going to the gym, or traveling. 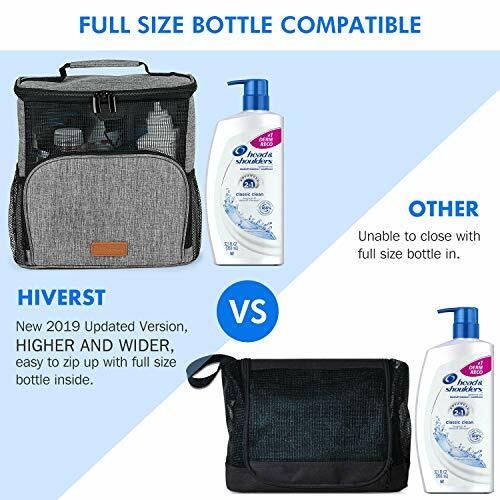 The Hiverst shower caddy is a great bag that can fit regular shampoo and body wash bottles. It is 10 inches long, 6 inches tall, and 6 inches wide – which is bigger than other entries in this list. These are new dimensions, made specifically to accommodate the most common toiletries out there. You can pack two full-sized bottles with other skin care products and accessories. There are two big main compartments – one on top and one in the front. There are three bands that keep the bottles in place, three smaller bands for smaller items, and two side mesh pockets for your accessories. 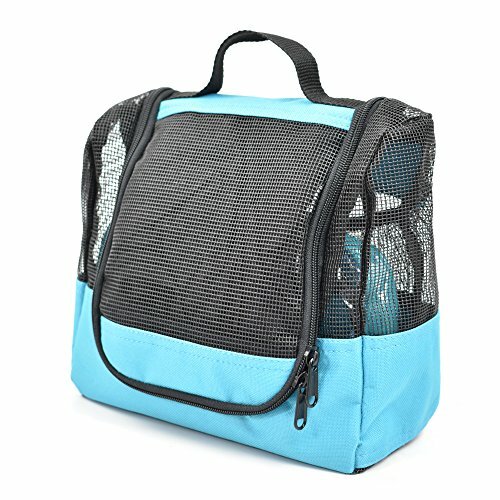 It is made of 600D Oxford material, which together with the mesh fabric, lets your items and the caddy itself to dry off quickly, resist mold and mildew, and resist water while remaining breathable. There is a hook that’s attached to it, so you can hang the caddy wherever. Don’t ever bend down to get your toiletries again. Simply hang it over the showerhead, the door, or any hook. The built-in handle can also make traveling between your room and the shower much easier. It comes with a free unique luggage tag so that you and your roomies won’t get the wrong caddy ever again. 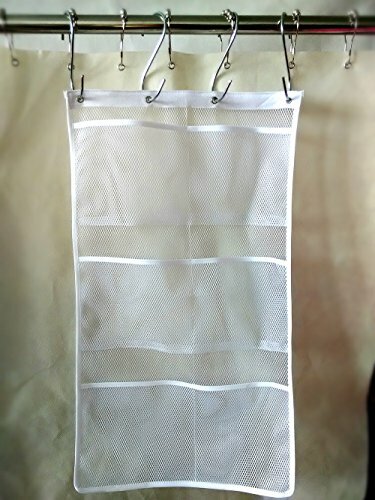 The Attmu Mesh Shower Caddy is made of durable mesh fabric. This high-quality material makes sure it will last long even with daily use. The caddy has a handle that can be used to hang it on hooks, pegs, or shower stands. This reduces the need for bending down to pick up soap or shampoo during showers. There are eight compartments on the outside and a big main one in the middle. These let you keep your stuff in place, organized, so nothing mixes with something else. You can store your shampoo, soap, conditioner, toothbrush, razor, comb, and other toiletries. This way you only need to carry one bag for all your bathing needs. You don’t have to worry about having your items being soaked and soggy. The material lets everything dry quickly, plus it is fully resistant to rust. Don’t ever worry about mold and mildew again. This is one bag you can use for a long time. It’s a great gift for anyone starting college. It’s lightweight, compact, stylish, durable, and easy to handle. You can also use it for camping, going to the gym, or just going on trips. The company gives a 30-day money back guarantee for any reason that you find it unsatisfactory. The ALYER Hanging Mesh Shower Caddy is very lightweight and can be used by college students – or even in any home. It is made of sturdy mesh fabric. It has durable metal hooks that let you hang it anywhere with pegs or hooks. The six big pockets can contain all of the bath accessories and toiletries. They are 7-inch wide and 6 1/3-inch tall. The design makes it such a space saver. You can hang it on closet rods, shower curtains, shower doors, at the back of the door, or anywhere you wish. When not in use, it easily folds into a small item. It can dry very quickly, making it resistant to mold and mildew. Plus, it is very easy to clean and store. It’s great for college dorms, gym, camping, and travel needs. If this is your first time off to college you might find this video interesting, we’re a college student gives her first-hand advice on college showers, as well as what to look for in a shower caddy. The wide arrange of caddies offered online provides users the advantage of choosing their favorite designs and not limit their choice when purchasing their new shower commodity. 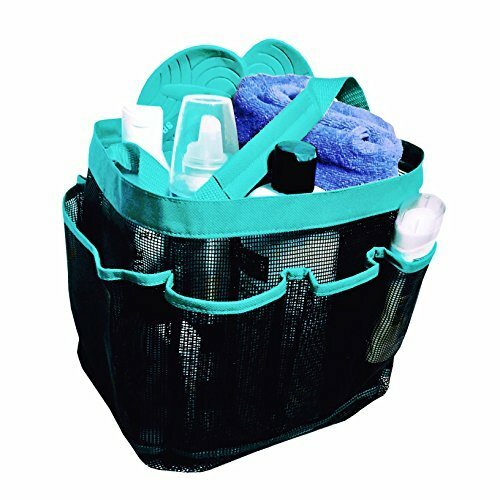 We have concluded that, when compared to the competition, the Mesh Shower Caddy by Maybest comes out on top given its incredible features and the affordable price tag. Have you made up your mind yet? Which product will you buy? Let us know in the comment section and be sure to check out our other reviews!